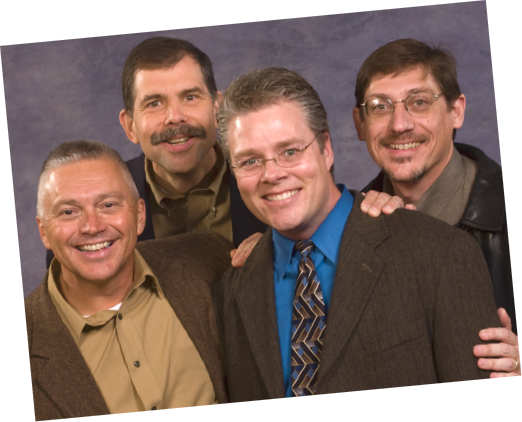 Chordiology has been competing off and on at Pioneer District Barbershop Quartet competitions since the late 1990’s. After consistently placing in 6-8th place, we decided to take some time off from competing and focus on improving our singing, and performing more often. That seems to have been a good decision, because in October of 2007 we decided to go to the competition again to see what kind of progress we had made. By gosh, we won the darn thing! No one was more surprised than we were! We’re so grateful to everyone (and there’s about four gazillion of you) who have been a part of Chordiology’s journey so far: every barbershopper we’ve sung tags with ‘til 3am, every coach who has worked with us, every retirement home resident who has smiled as we sang “Hi Neighbor!”, and most important, our wives who support us through it all, even when we forgot to tell them about tonight’s rehearsal. 2007 Pioneer District Quartet Champs! Do you live in or around Michigan, and want to sing? Download this list of Barbershop Harmony Society chapters to find a chorus near you, and come SING!! No experience is necessary, and you don't even need to be able to read music. If you want to sing, then you CAN.